FLORHAM PARK, N.J. (AP) — Sam Darnold remembers sitting at home in Southern California watching Andrew Luck sling the football all over the fields of the Pac-12 for Stanford. 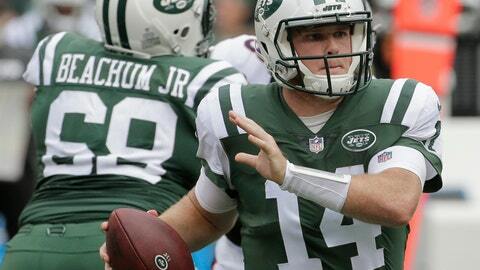 But, both coach Todd Bowles and offensive coordinator Jeremy Bates have been happy with Darnold’s consistent progress during the early part of the season. In New York’s 34-16 win over Denver last Sunday , Darnold threw three TD passes, including a perfectly placed 76-yard TD toss to Robby Anderson that showed the young QB can stretch the field a little, too.